And so, it reached out to me again and I decided to wall it. At first, I was going to make it on a paper texture again and then, the idea of making it into a graffiti struck me. After experimenting with some layers and such, I finally finished my concept! 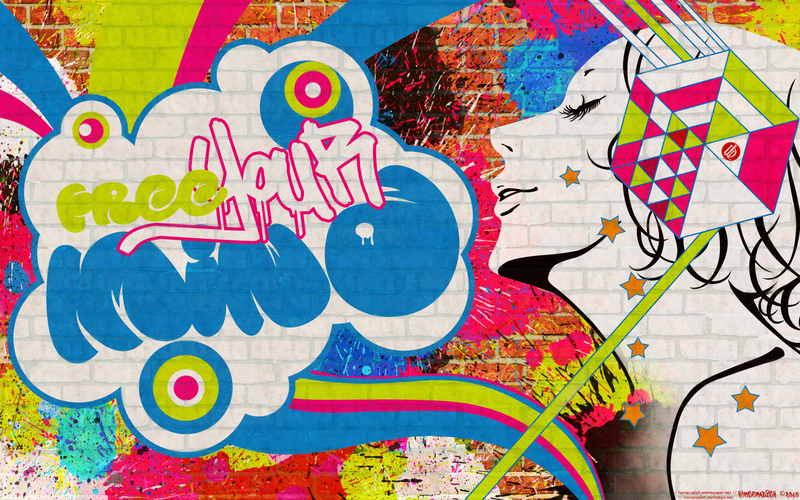 (^__^) I browsed for some graffiti fonts too to match it with the BG and vector that I did. A comment, FAVE, DL, comment+FAVE, comment+DL, OR a comment+FAVE+DL would be most appreciated. Thank you all in advance! a good splash of vibrant colors, some texture...It's amazing how you come up with this stuff! i love it. soooooo colorful and everything seems to be in balance.. It's a really colorful creation, but a very imaginative one, too! It's gorgeous, and I'm surprised to see how well Kunie Kanbara's art blends well with the graffiti style. Thanks for spreading Kunie Kanbara's love everywhere on MT! Lol, I'd love to see this as graffiti around town somewhere~ XD Nice work! Awesome colors great style thanks . This piece really stands out from the regular simple styled wallpapers made of Kunie Kanbara’s images. Absolutely love the urban atmosphere and the flashy vivid colours here ! Composition works nicely and looks harmonic even though there are lots of different kind of elements like text, paint splatters and the character image. Whitish colour brings good balance to bright colours, but in the other hand it also lets them really stand out. Paint-like style and especially the big outlines of the text gives lively look for the graffiti. Personally though, I find the fine blue lines of the stars and the angular pattern breaking the overall look a bit, since they are bit too even to my taste when comparing to the overall look. But in the end everything seems to blend smoothly together and the result isn't looking too crowded, which makes it pleasant to look at. Awesome work !